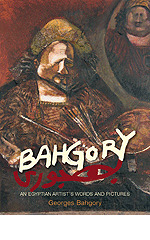 Bahgory An Egyptian Artist’s Words and Pictures Soft Cover"
Painter Georges Bahgory cites Picasso and the Egyptian Fayoum portraits as major influences on his work; he creates striking abstracts that draw the viewer into a world that can be dark or whimsical. A keen observer of events that unfold around him, he is in the habit of sketching his impressions in carnets de voyages (sketchbook diaries), many from Egyptian street scenes that are recognizable to anyone familiar with Cairo daily life: a man riding a bicycle bearing a tray of bread on his head, boys playing football, women in a market, people in a café, musicians. This new collection of the artist’s paintings is accompanied by extracts from his autobiographical novel The Icon of Faltas. Turning from the brush to the pen, he has created vignettes, each a brief scene in a richly textured tapestry of imagined narrative. His descriptions convey an acute awareness of the sensual landscape that amplifies his painterly imagery. Expressing himself as ardently in words as he does in paint on canvas, Bahgory offers another dimension of his creative spirit with Bahgory: An Egyptian Artist’s Words and Pictures.